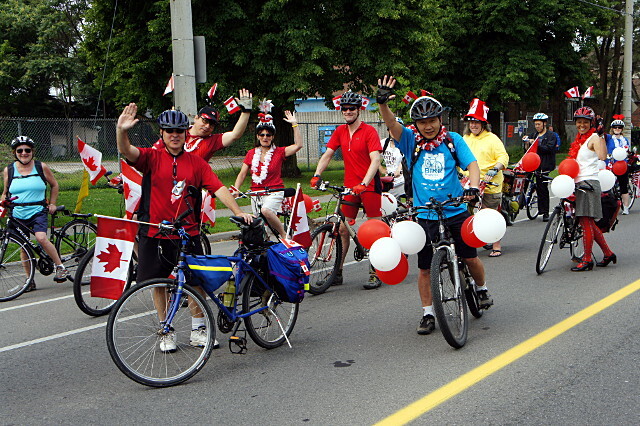 Ward 29 Bikes invites all cyclists to ride with us in the East York Canada Day Parade, our must fun event of the year. Riding in this local tradition is the best way to have way too much fun celebrating your community. We’ll be gathering starting at 8:30 a.m. on Tuesday, July 1 at Dieppe Park (on Cosburn east of Greenwood). We’ll provide decorations; you just need to bring your bike and a smile. Check out the fun we’ve had in previous years and contact us if you want more information about the parade or to confirm your participation. If you’ve ridden with us before, please note the new starting point this year at Dieppe Park on Cosburn east of Greenwood. Yes! Parades are best experienced from the inside. Yes! We’re in a parade! What could be safer than that? Can my whole family participate? The more the merrier. People of all ages can participate in the parade with us. All you need is a bike (or a trike!). The parade takes between 60-90 minutes. Most of the riding is at a walking pace and is very easy. Do I have to decorate my bike? You don’t need to, but you know you want to. If you arrive at Dieppe Park before 9:00, we’ll be able to help you decorate with balloons, ribbons, fascinators, pinwheels, flags, and whatever else we can pull out of our red-and-white stash. Most importantly, please dress appropriately for the weather. Be sure you have sunscreen and headwear if necessary. We recommend wearing either red and white or Ward 29 Bikes blue. Just make sure that you’re comfortable. Sounds great! I’ll see you there! Ride in the 2018 East York Canada Day Parade! Ride in the East York Canada Day Parade!